At Sydney Gutter and Roof Restoration we use continuous length guttering (up to 12m) to eliminate troublesome leaks and joins. There are 15 great colours to choose from in steel or aluminium, in six popular profiles. Regardless of whether you have a metal, tile, slate or polycarbonate roof your gutters and downpipes play an essential role in the efficient removal of rainwater from your roof. Leaking gutters and broken downpipes can lead to much bigger problems if not addressed promptly. For over 40 years Sydney Gutter and Roof Restoration have provided a complete gutter replacement service throughout the Sydney metro area. With thousands of satisfied customers our reputation for the highest quality materials, workmanship and value for money is the best in the industry. 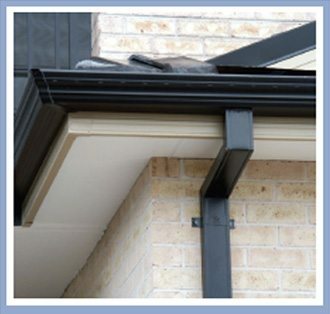 Our gutters and downpipes come in a range of profiles and colours and are covered by Ace Gutters 20 year warranty. We can also supply and fit a custom made leaf screener to ensure that your gutters and downpipes remain clean from leaves and debris. For an obligation free gutter inspection, measure and quote call 1300 654 884 or use our easy online contact form below.